Remember that crazy Super Mario 64: Chaos Edition mod? The one that injects random cheat codes into Super Mario 64 and turns it into an unplayable mess where you inexplicably become a signpost or get chased by a sentient tornado of murderous debris? It’s goofy fun but entirely impractical, an experimental tribute that no sane person should play for more than 30 minutes. Kaze Emanuar, Chaos Edition’s creator, just released a new Mario 64 mod that’s actually meant to be played. Called Super Mario 64: Last Impact, it’s one of the biggest, most ambitious Mario 64 hacks ever produced. Using bits and pieces from the Nintendo classic and plenty of programming of his own, Emanuar has built an entirely new game that, while not nearly as refined as its inspiration, expands on it in some impressive ways. Last Impact follows a similar structure to the original game. Mario enters a bunch of themed sub-worlds—a beach, a lunar base, the cloud-covered branches of a giant tree—and performs various tasks to collect stars. The more stars you have, the more worlds you can visit and the closer you’ll be to confronting the game’s bosses. Emanuar’s creation is much harder than traditional Mario 64. Some of that’s by design (if you check out his YouTube comments, you’ll see he’s not shy about dissing Nintendo games for being “too easy”), but having just written about and played the original, I couldn’t shake the feeling that much of its difficulty comes from Mario 64’s limitations rather than its own devious design. Emanuar clearly has a grasp on what does and doesn’t work within the game’s primitive framework—Mario’s slow acceleration and inaccurate jumps, the camera’s fussy predetermined pans—but he often pushes it too far, resulting in situations where a simple act like walking up a set of winding ramps is harder than 90 percent of the original game. Mario 64’s strength is not precision, neither in your control over Mario nor your ability to find the most helpful angle with its rigid camera. But it plays as well as it does, even to this day, because its designers understood those weaknesses. They built the game’s levels and challenges with enough wiggle room for players to stumble their way through, only demanding precision when a prize was on the line. Last Impact strays from that philosophy a little too often to be truly enjoyable—battling against the camera should not be a game in and of itself—but it makes up for frustrating design with plenty of ingenuity. Taking a page out of Super Mario Galaxy’s masterful handbook, Emanuar has packed his hack with power-ups borrowed from all over the series. There’s the frog suit from Mario Bros. 3, the bee suit and cloud suit from the Galaxy games, and even the FLUDD water jetpack from Mario Sunshine. Each of these is new to Mario 64, and Emanuar has done a great job of building challenges that integrate them in a way that feels natural. The hack’s original worlds are just as well considered, full of fresh concepts and even simple narratives that unfold as you move from star to star. It really is a wholly new game. Between all the new levels, the 130 stars, the power-ups, an expansive soundtrack of Nintendo tunes remixed in Mario 64 style, and tons of original characters (the models are horrendous, but it’s the thought that counts), Emanuar’s claim that this hack took more than 4,000 hours to develop doesn’t seem all that farfetched. It’s not exactly a joy to play or look at, but it’s an admirable labor of love from an amateur developer working with an incredibly limited toolset. 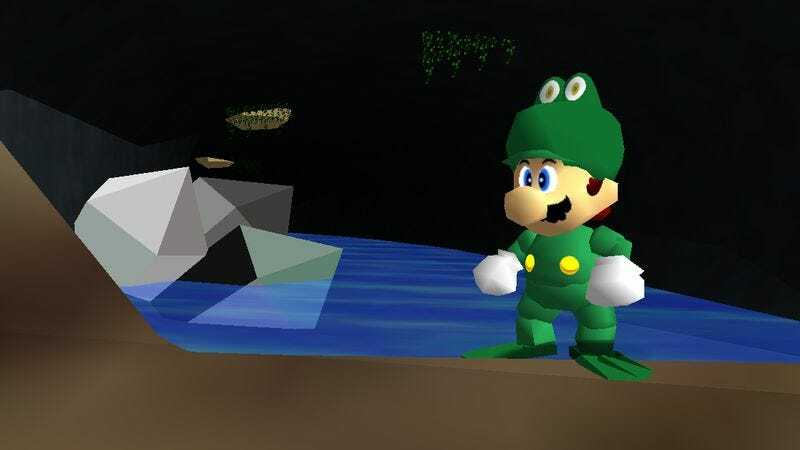 And I have to admit, getting to see that polygonal little Mario dressed up in costumes from across the series got my nostalgia centers firing hard. You can download Mario 64: Last Impact for yourself here, assuming Nintendo hasn’t yanked it from the internet. You’ll need a Nintendo 64 emulator program to play it, and getting the whole thing set up properly takes a bit of tinkering. Fortunately, Emanuar has put together a video tutorial to help get you started.